For a traditional look combined with all the benefits of modern technology, look no further than O'Grady uPVC's vertical sliding windows. 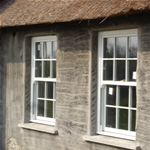 Also known as Sliding Sash windows, the uPVC version of the old-style timber frame provides a remarkably authentic look in both refurbished older houses as well as new-builds. All the benefits of standard double-glazed uPVC units - freedom from maintenance, security, selection of colours and finishes, exceptional thermal and sound insulation - apply equally to our top-quality vertical sliding units. Like all our window units, our Vertical Sliders are manufactured to the highest specification in our computerised workshop. Veka's Matrix 58 uPVC profie and Carey Glass' Vistatherm Elite double-glazed units combine to offer unrivalled performance in terms of thermal insulation, sound insulation, security and appearance. 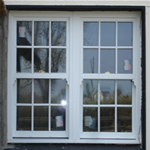 VEKA's uPVC profile for Vertical Sliders offers many advanced features including . . Flush Gasket Detail - so less gasket is visible. stop giving an authentic sash window appearance. 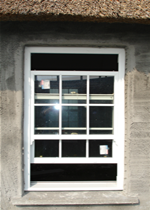 Large and small Sash options - giving equal sightline top & bottom. 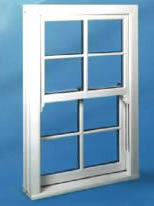 All top Sash interlock - increases the rigidity of large windows. 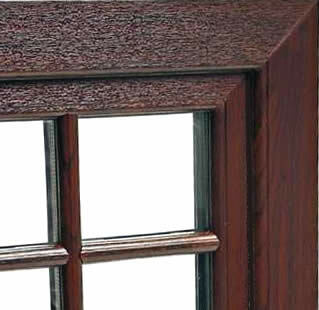 Deep bottom rail for a traditional vertical slider appearance.